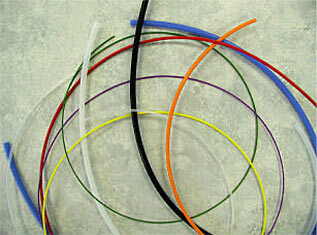 Non-Shrink TFE Tubing is virtually friction-free and one of the most versatile insulating materials made. TFE Tubing is the most versatile insulating material, offering highly stable electrical properties at virtually all electronic frequencies throughout an operating range of -70°C to 260°C. TFE tubing is nontoxic and will not burn in normal atmosphere at any temperature, and is inert to practically all lubricants, solvents, and reagents. Electrical performance is excellent, offering extremely high dielectric strength even in the thinnest cross sections, with hot soldering irons and sub-zero environmental conditions having no effect. TFE tubing possesses the lowest coefficient of friction of any known solid. It is also resistant to wicking, moisture absorption, or contamination from objectionable sources. TFE tubing is the material to specify when the reliability and dependability of an application at environmental, electrical, mechanical, and chemical extremes is paramount.